Popular culture has its way of presenting 'hallucinations'. In the movie 'A Beautiful Mind' the character Dr John Nash has conversations with characters he used to hallucinate. Is it possible to have interactions with one's imagination? In order to answer your question, it would be helpful to differentiate between imagination and hallucination because they are not synonymous. Imagination is an experience (not perception) of mind in which mental images or concepts are created by active voluntary process (can be switched on and switched off). Here mind can separate imagination from reality. Seeing, hearing or other strong senses will obliterate our imagination. It is usually a normal brain function. On the contrary, hallucination is a disorder of perception which involves the sensory pathway coming from one or more sense organs like ears, eyes, skin, etc., in absence of any stimuli in the external environment (e.g. hearing voices, seeing images, feeling something crawling on the skin etc.). Brain centres, which receive these impulses and interpret them, are also involved in this situation and the mind fails to differentiate that this is not a shared experience by others. Hallucinatory perceptions are automatic or involuntary, which means one can't turn it on or off (can't access the switch in the brain!). Here subjective reality very strongly clashes with objective reality. 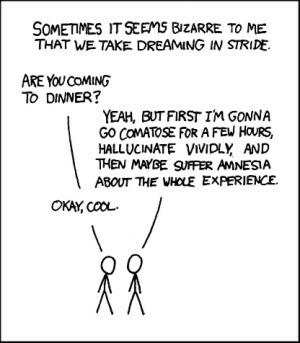 Hallucination is mostly (but not always) pathological. I had an intention to watch “A Beautiful Mind” again to respond to your queries regarding the character Dr. Nash. I've watched that movie a few years back but the memories have faded by now. Anyway, as far as I remember, it was portrayed in the movie that he had both visual and auditory hallucinations with paranoid feelings and bizarre behaviour. Those are quite common in Schizophrenia and he was shown as a case of Schizophrenia, I guess. When people hallucinate, of course they interact with the voice or images as if they really exist (in their mind there is no doubt that it is coming from the external environment, so why not!). If your question is really about whether we interact with our imagination, then the answer is within you! Don't you ever talk to your long lost friend or a lover or (at least!) an enemy in your imagination when you are alone and nobody is watching? I guess we all do it quite smartly when we are totally consumed in our imaginary worlds but quickly bring ourselves back as soon as we bump into a real person or an object in the immediate environment. What I found was striking in that character was that he was able to interact with the hallucinatory voices and images in such a private manner as if he was able to recognise that this is not a shared experience. I believe it is unusual but not impossible in Schizophrenia to recover this much insight and be able to live in these two worlds at the same time. I've seen that happening with some of my patients (not all were suffering from Schizophrenia though) who finally learned to live in peace with those hallucinations and managed to function better by doing some reality testing, which can be considered as a huge astonishing recovery among this population. In case of Dr. Nash, the residual intellectual capacity that remained after the acute psychotic breakdown could still be above average given the fact that he was a born genius! So, no wonder in real life he got the Nobel Prize even after suffering a disease like Schizophrenia (he is really fortunate!). Although I've read that he later criticised the movie character and claimed that he never had visual hallucinations and was never treated with new generation anti-psychotics. There were rumours that he was going through a tough time (scandals, threats of losing job and reputation etc.) could have played a greater role in his psychotic breakdown than any other biological factor which is a good prognostic factor in recovery. A few years ago I underwent an operation on my right index finger. The operation left a scar on my finger and I also find it difficult to straighten my finger. This problem is getting worse with passing time. The scar also seems to have darkened over time. Could you kindly suggest what I should do? Thank you for the letter. You did not mention why you needed the surgery. Was it a burn injury? It sounds like your finger is developing contracture, which is common in burn injuries. In the case of a contracture, you are to face problems when moving your finger. This contracture needs to be released and if possible a scar revision needs to be done. You will also need physiotherapy following the surgery so that you can move your finger easily. Please consult with a plastic surgeon and get the treatment as soon as possible. My son was born with a cleft lip. He is three months old. When can we opt for an operation? This is the perfect time for repair of cleft lip. We usually encourage surgery for cleft lip as soon as the patient is one month old, in good health and does not need any other treatment. These surgeries are commonly done now and the outcome is great. There is no need for you to be afraid or worried. Healing is very quick and as the baby is young there will be faint scarring. Please consult with a cosmetic surgeon and get the surgery done without any delay.